Okay, why didn’t anyone tell me about Trance? How come I didn’t hear about this movie until I happened to be … uh, researching Rosario Dawson (researching?, yeah researching… sure researching her, uh… career to date… for a project I’m working on. Yeah, that’s it) and came across this film. Luckily, I was able to find a theater not too far from me still showing it (once daily at 10:30 pm, but whatever). Okay, fact of the matter is Rosario Dawson is and has been the most attractive (that would be: hottest) actress on the big screen for some time, and I see all her films (she’s also into a lot of charity work and whatnot, so she’s a lot more than just a pretty face…). Not to mention the premise of this film sounded interesting. I purchased my ticket online within minutes of discovery. 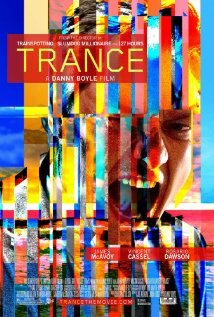 Some spoilers here, so if you haven’t seen Trance, and you want to, just pause your reading here and go see it before it’s too late. This page will be here waiting for you when you get back. It’s good – go see it already. Gorgeous shots of London streets. Cinematography generally gorgeous. A pleasure to look at. Ditto the soundtrack. Strong and forceful – if one wanted to be negative, some might call it a tad overbearing, but I won’t. Its strong insistence made me feel strangely powerful and I became all the more enamored (‘enamoured’ in London?) of the film due to it. One hell of a head game, along the lines of Inception, with the exception being we are not let it on which level we’re on at all times… The plot twists and turns like a writhing snake. This leads to what one poor fellow in the audience felt was a strong con (he was shouting his disapproval of the film and why from his seat during the end credits), but which I eventually liked quite a bit, although it did make me uncomfortable throughout the film: You can throw any idea of protagonist, good guy bad guy what have you right out the window. After things get rolling, you’re not sure who’s good, who’s bad, whose side anybody is on, etc etc. This really upset the poor aforementioned fellow by the end of the film, whereas I found it troubling during the film because you had to keep up emotionally with various possible outcomes, but by film’s end I was completely satisfied with the outcome (granted my aforementioned weakness for Ms. Dawson, and by extension any character she plays…). So that’s it for cons – some of you may not be able (or is it willing?) to grasp the conclusion, but I recommend it nonetheless. Honestly there’s nothing terribly new here, but not every film breaks new ground. It’s a beautiful, somewhat mindful film in an age of mindless bling, and it’s fun and entertaining too. Check it out.